Tracks TV schedules from the Notification Center. Is there a better alternative to TV Today? Is TV Today really the best app in Entertainment category? Will TV Today work good on macOS 10.13.4? TV Today tracks TV schedules quickly and easily right in your Notification Center. 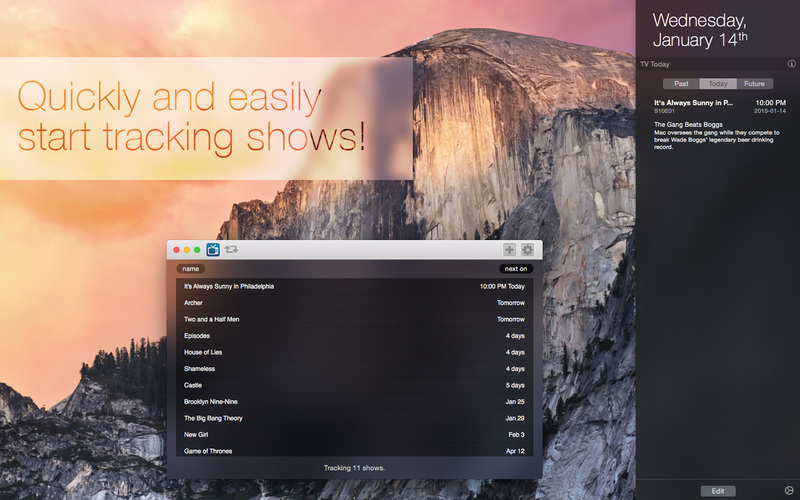 It's a simple, fast app and extension for tracking TV shows. TV Today runs as both a standalone app and a Notification Center widget, making it incredibly easy to track and view your favorite TV show schedules. See at a glance upcoming episode descriptions, season and episode number, airtime, and more. Contact us on Twitter @TVTodayWidget with any questions, suggestions, or in case we aren't yet tracking a show you follow. Currently tracking 175+ shows with more added daily!